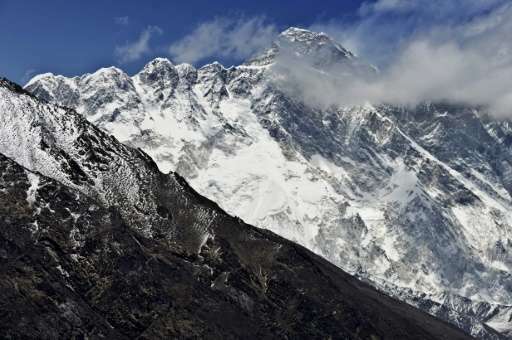 Nepal has begun remeasuring Mount Everest to check if the height of the world's tallest peak was altered by a powerful earthquake that struck the nation in 2015, the government said Friday. The official height of Mount Everest—which lies in the Himalayan range, straddling the border between Nepal and China—is 8,848 metres (29,029 feet), first recorded by an Indian survey in 1954. Numerous other teams have measured the peak, although the 1954 height remains the widely accepted figure. "Nepal has never measured Everest on its own although the world's highest peak lies in its territory. So we want to prove to our people that Nepal is capable of measuring Everest," Ganesh Prasad Bhatta, head of the government's survey department, told AFP. A team of Nepali and foreign experts have begun refining the methodology for the new survey, which is expected to take two years, Bhatta said. A team of Sherpas will take measuring equipment to the summit either in April, the beginning of the spring climbing season, or October, another period of good weather on Everest. In April 2015, a 7.8-magnitude earthquake hit Nepal, causing widespread devastation across the country and triggering an avalanche that killed 18 people at Everest's base camp. Many have speculated that the quake altered the mountain. A heated debate erupted in May over the condition of the Hillary Step—a rocky outcrop and route to the summit just below the peak—with an experienced British mountaineer saying it had collapsed in the quake, a claim rejected by local guides. "Concerns have been raised about the height of Everest after the April 2015 earthquake, but it is not only the reason to remeasure the Everest," Bhatta said. Six years ago Nepal said it would remeasure the mountain after becoming embroiled in a diplomatic row with China, who claimed the peak was four metres shorter than the accepted height. The project never got off the ground. In May 1999 an American team added two metres to Everest's height when it used GPS technology to survey the peak. That figure is now used by the US National Geographic Society but otherwise not widely accepted.